2 How to store carrots in the cellar? 3 How to store carrots in the refrigerator? Before giving instructions on, how to store carrots, it is important to address the subject, how to collect. 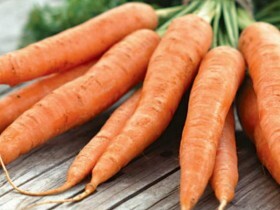 First of all, a week before, how to start a clean harvest carrots, it needs to be watered every day, sparing no water. What will it give? Carrots will be bigger in size, juicier and, Consequently, delicious. Yes, and removing it from the ground will be much easier. Secondly, a few days before digging, it is necessary to weed the beds and cut the tops, leaving a bit length. Why cut off the tops? Then, to moisture and useful vitamins are preserved in the product. 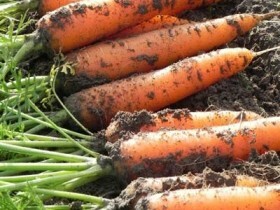 If, during the weeding carrots even a little - a little corrupted, it is not necessary to store such, it will begin to deteriorate and spoil the rest of the vegetables. It is also important not to clean off the dirt, This protects carrots from the disease. Easy. dig, pull and fold. Then sheltered than - or leave the carrots on 3 day, so that it is cool, since the higher the temperature of the earth, than at the top. Then iterate vegetables. From poor quality carrots do not have to rush to get rid. It can be used for making preparations for the winter. How to store carrots in the cellar? First thing, pay attention to the temperature, which should be in the room. To Carrots are not frozen and not germinated, necessary to maintain the thermometer reading mode 0 – +2 degrees. Now, how to store carrots. In a large plastic bags, pre-holed at several locations. During storage bag with carrots should be opened. It is very important! Find a wooden box. It must be firmly shot down. The size, depending on the crop. You can use several containers at once. The bottom of the box go to sleep thick layer of sand. Laid in a series of carrots, then again richly sypem sand. And so each row, until the box is full. In many basements there is a plurality of shelves. 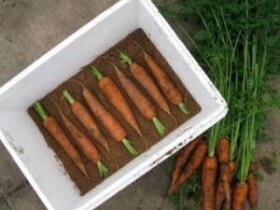 Carrots can be stored on them, laying in a row, respecting the distance, to layout was not close. Everything. More nothing else to do, only temperature control. How to store carrots in the refrigerator? the, who lives in an apartment and a cottage, but it does not have a basement, it is difficult to solve the problem of storage crops. So gardeners may be advisable to store carrots in the refrigerator. Fold vegetables can be in a box made of cardboard or package, which is then tightly close. Carrots packed away in a container for vegetables, which is available in every refrigerator. Of course, for this purpose the unit is better to have a large. There are also cases, when people try to save the crop in the freezer. Rubbed on a coarse grater, packed in bags and put them in the freezer. With this store the desired properties of carrots are lost. Fresh carrot not eat, but can be used for soups. What else can advise city cottagers? If only send carrots for storage on the balcony. true, This method will bring nothing but trouble. If it is cold, We have to hide, if it's hot - hiding in the shadows. continuous darkness. But, to grow crops, well worth spending a lot of effort. Shame will then, if he died because of improper storage.